This year we had Storyteller, Malcolm Busby at our wassail, enthralling the audience with the traditional tale of the ‘Apple Tree Man’, who was believed to live in Herefordshire orchards, but, who knows, maybe he will move over to East Anglia, with all this wassailing to warm him. Malcolm really looked the part, dressed all in green. You can contact Malcolm on storyteller@malcolmbusby.co.uk if you’d like to hire him. 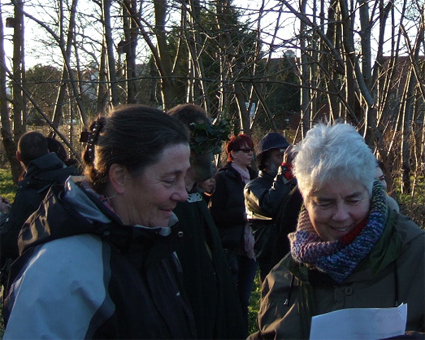 Trumpington Community Orchard is proud to be a local, community project, and that was certainly evident at the wassail. So many thanks to all those who helped out, including Dave Osbaldeson, who performed on his cornet, Julia, who sang, Liz who put posters all around the villages, and Susanna and Ceri who did everything else. And thanks to everyone who turned up, sang, danced and took photos. Was Hael (Good Health) to you all.